, performing well ahead of the pack on 12.5% audience share after gaining 2.4 points from last survey. Australian Radio Network (ARN) stablemates Jonesy and Amanda dropped their second place position after losing 0.1 points, with Southern Cross Austereo's (SCA) Triple M taking the number two spot on 7.2% audience share. In its second survey period since launch, SCA's 2DayFM breakfast team of Rove McManus and Sam Frost stayed flat over the period, on 3.0% audience share. Overall, 2GB continued its unstoppable run in breakfast after gaining another 0.8 percentage points to hit 16.0% audience share, followed by ABC702 on 10.5% after a slight dip. The reshuffle continued in drive time, with long time FM winners Nova's Kate, Tim and Marty losing the lead to Kiis' Hughesy and Kate, who reached 11.6% audience share. Nova dipped 0.4 points in the period to finish on 9.1%, while ABC stations Triple J and ABC702 reached 10.6 and 9.8% audience share respectively. 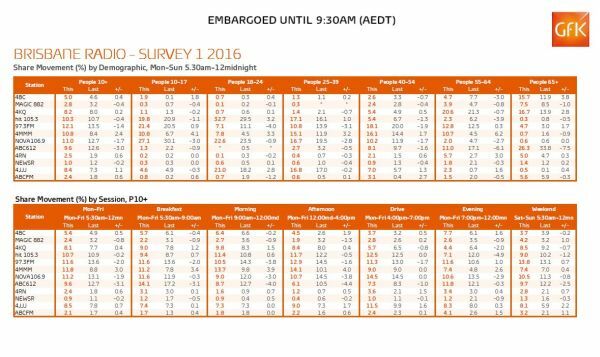 2DayFM's drive team stayed relatively flat on 5.5% audience share after gaining 0.1 points over the period. 2GB picked up the highest overall audience with 11.6% audience share, followed by Kiis on 9.8% audience share. Gold104.3 and ABC774 have made solid gains as listeners tune off from FoxFM during the important breakfast and drive slots. During drive, Gold gained 2.3 percentage points to 9.4% of the audience share, which lifts the station to third spot. Gold's drive is split between Gavin Miller and an hour of Jonesy and Amanda. Fox, with Hamish and Andy, held onto top spot despite shedding 2.3 percentage points to 10.5%, and 3AW was second on 9.9%. During breakfast, ABC's Jon Faine was the big winner gaining 2.6 percentage points to 16.5% of audience share. 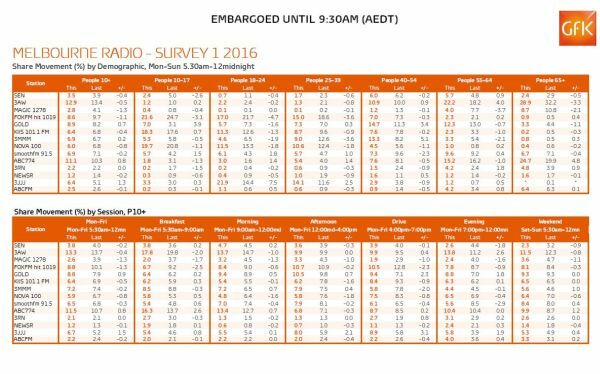 3AW's Ross and John 2 percentage points, but still hold onto top spot with 17.8 percentages points, while Triple M is the best performing FM station with 8.5 percent of audience. Fox has suffered huge losses across younger demos, down 3.1 percentage points in 10-17s, 4.7 percentage points in 18-24s and 3.6 percentage points in 25-39s. Oddly, Gold is resonating with 10-17s (up 3.9 percentage points) and 40-54s (up 3.4 percentage points). 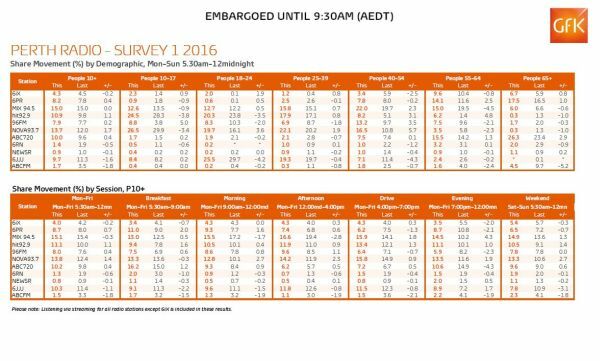 The ABC has seen a huge jump in people older than 65 while Triple M has made huge gains in 40-54s. While Brisbane's 97.3FM continues to lead the field with the largest listenership (12.1 percentage points), Triple M is holding fourth place but has made bigger gains than any of the other stations in the pack. Reaping an overall 10.1 percentage points, it has grown 4.1 in the 10-17 demo, 3.2 in 25-39 and a staggering 6.2 in 55-64, where incidentally the local ABC station has shed 6.1 percentage points of its listeners. Clearly the station will be one to watch over the course of the year. Nova's Kate, Tim and Marty shot to the top of Brisbane's drive slot, in the last set of ratings and they continue to hold the spot with a majority 14.5 percentage point share. There has been no change in audience figures for the timeslot, as Hit 105.3's Hamish and Andy show comes a second close with 12.5 percentage point audience base. In the breakfast slot, ABC 612's Spencer Howson continues to dominate although last year's 17.2 share has now slipped to 14.1. Robin, Terry and Bob at 97.3 FM slip two percentage points to 11.6%, and Nova 106.9's Ash, Kip and Luttsy slide a mere .3% to the same 11.6%. Mix 102.3 has lost its market dominance in Adelaide after capturing a 13.0% audience share last year. The station is now in third place after slipping to 11.4 percentage points, trailing third behind ABC891 which has grown 0.2% points to 12.6% - putting it in poll position – and Nova which has climbed 0.4% to 11.6% points. ABC891 still continues to rule in the breakfast slot, increasing last year's 17.8% audience share to 18.9%. Its nearest rival is FIVEaa with an 11.9% share. In the drive slot, Nova 91.9 overtook Mix 102.3 for first place late last year and continues to hold the spot. Nova boasts a 14.2% shareagainst nearest competitior hit107 which trails with an 11.1% point share. Overall listeners in the first radio ratings of the year sees Mix 94.5 continue to be Perth’s favourite station overall, with a listenership of 15%. It's followed by Nova 93.7 with 13.7%, after it increased by a healthy 1.7 percentage points. Triple J dropped out of third spot with Hit 92.9 taking its mantel, with a 10.9% audience share. Triple J now sits at fifth spot overall, with a 9.7% audience share. ABC720 has held onto its place in Perth as the most-listened to breakfast show, scooping an audience share of 16.2% - a rise of 1.2 percentage points compared to its end of year (2015) radio ratings' share of 15%. Nova 93.7 remained second spot in breakfast, with 13.3%, followed by SCA’s Mix 94.5 which earned 13% percentage points – a climb of 0.5 percentage points compare to the last radio ratings. Despite a climb of 0.9 percentage points in drive time, taking it to a 15.8% share, Nova 93.7 dropped out of its top spot position in drive to number two. Mix 94.5 now sits in the prime position at number one in drive with 15.9% - having climbed 1.8 percentage points. Kiis hosts Kyle and Jackie O have come out swinging, taking the top Sydney FM breakfast spot in the first radio survey of the year. The duo continued their momentum from 2015, performing well ahead of the pack on 12.5% audience share after gaining 2.4 points from last survey.